GPS trackers need power. When you’re managing a single tracker, and it’s always within a few miles, then it’s not such a big deal. You can just manage a battery. But what about managing a tracker on the back of a truck headed across the country? What about stationary equipment which might not get used for months at a time? Unfortunately, there are really only imperfect solutions to this problem. But one of the better options happens to involve solar panels. Solar powered GPS trackers can provide more accessible means of non-powered asset tracking. How might you put this to use? That’s really up to you. It might be for monitoring a driver’s behavior, improving fleet performance, or getting more accurate fuel tax reporting data. It’s one of those not-so-uncommon instances where your imagination is really the limit. 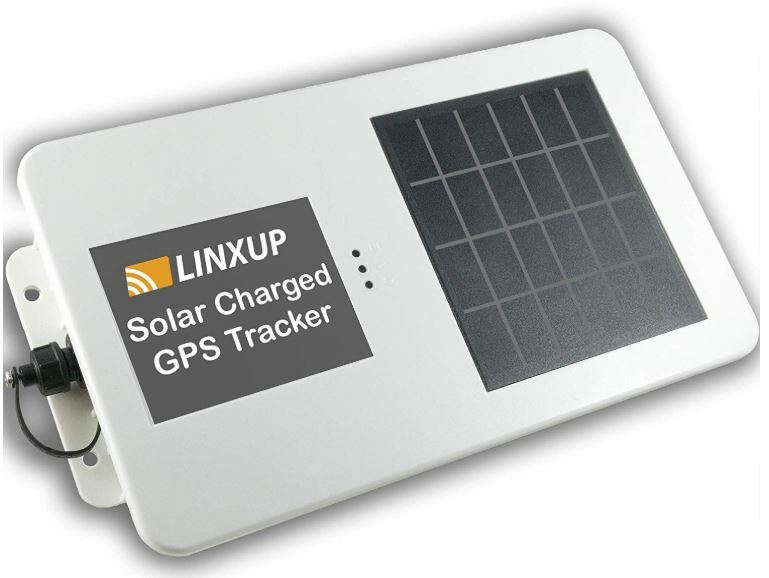 As its name suggests, the Linxup LAADS1 is a GPS tracker that’s charged with the use of a solar panel. First and foremost, that means you don’t have to micromanage disposable batteries, or deal with wired connections. Just place the Linxup LAADS1 on the top of whatever it is you want tracked. Face it towards the sun as best you can. And that’s it. The Linxup LAADS1 is basically as flat as a board. It actually resembles a large sun-powered calculator, measuring 8.4 x 4.7 x 1.1 inches, and weighs about one pound. But unlike a calculator, the Linxup LAADS1 is actually quite nondescript. Giving little outward indication of what it is, the LAADS1 also isn’t littered with a bunch of part numbers identifying features to help someone search. Just about the only thing you can immediately identify is the solar panel. On the bottom side of the LAADS1, about half the device is taken-up by that build-in solar panel, measuring roughly three-by-three inches. Relative to the rest of the system, this paneling actually deliver quite a bit of power. While solar panels are cheaper than ever before, they’re still not totally inexpensive, and this sizeable panel does contribute considerably to the price. Speaking of price, one of the reasons why the Linxup LAADS1 is so reasonably priced is because it’s an OEM part. However, there’s always a flipside to buying OEM equipment. You’re not going to get a bunch of extras, and that includes additional mounting hardware. 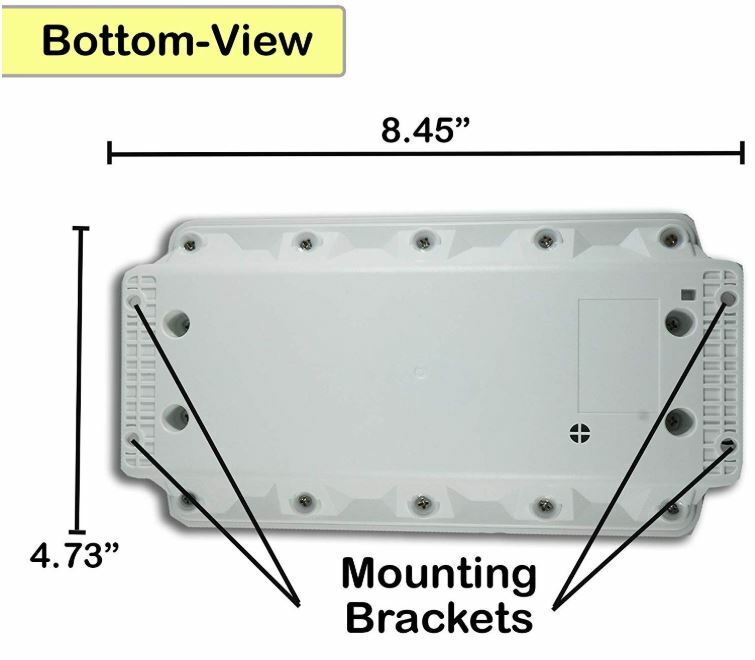 Nevertheless, along the outer edges of its bottom side, there are four mounting brackets. And with minimal imagination, you can use those brackets to conjure up multiple installation options. Essential to any device that’s expected to spend its time outdoors, thorough weatherproofing is an integral part of the LAADS1 and its design. Anything expecting to draw power from the sun will be spending plenty of time outdoors. And rain isn’t the only thing to be concerned about. Even if you’re setting up panels in the desert, grains of sand can be just as damaging as gallons of water. The LAADS uses a hardened white chassis, tightly sealed around each of its joints, providing rigorous IP67 weatherproofing. That rating basically means the device is protected from contact with harmful dust, as well as protected from emersion in water for up to half an hour and 3.3-feet. Basically, you could drive the LAADS1 through a flood-zone. And the tracker would be okay as long as you didn’t park. This rugged design is what allows it the Linxup LAADS1 Solar GPS Tracker to be deployed in both desert and marine environments, as well as more modest conditions between. The weakest portion of its design is the connection cable. It’s connected by a screw-cap, which is further locked in place with an actual screw. 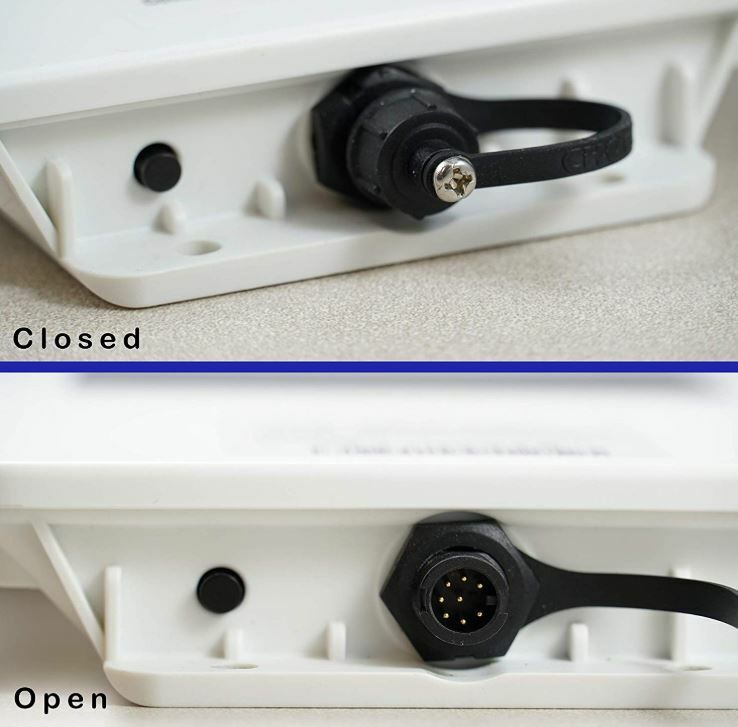 Within, the standard 8-pin cabling will most likely never have to be used, but the external cap coverage is critical to maintain waterproofing protection. With the IP67 protection, grit and rain are generally no issue. But that’s not to say that the Linxup LAADS1 Solar GPS Tracking Real Time Tracker is an invulnerable. Far from it, some of its more pertinent constraints relate to operating temperature. Surviving between -22°F to +158°F, the Linxup can take on some pretty diverse conditions. The white polymer chassis protecting the exterior of the Linxup LAADS1 GPS Tracker is quite good at helping to dissipate heat. So even in exceptionally hot circumstances, you really don’t have to be worried about the tracker. Cold is another matter. It’s fair to say that the weakest part of this weatherproofing relates to protection from the cold. If you live somewhere that dips below -22°F, then the internal battery is going to have issues. That does describe many parts of the United States during the colder parts of the year. Outside of those extremes, the thoroughly weatherproofed construction of the LAADS1 holds up excellently. But when it’s literally dangerous to be outside because of weather extremes, that’s when you’re going to want to rethink your use of outdoor equipment. Like a cellphone needs cell-service, a GPS device needs GPS service. The GPS portion of the Linxup LAADS1 Solar Tracker connects up with the help of 3G cellular networks. Additionally, their service is priced about average compared to similar GPS services, available for $14.99 monthly. Because this tracking network makes use of cell towers, there are small regions of the country where tracking won’t work. Sitting in a pocket within the earth, two mountains on either side of you, then you’re probably not going to have cell reception. Likewise, you’re probably not going to be able to hear anything from your tracker in these positions. With respect to reporting, the tracker has been built with a great emphasis on battery performance. Mobile GPS trackers often offer something in the neighborhood of 30-second reporting intervals. The Linxup LAADS1 offers reports at 10-minute intervals, assuming the tracker is in motion. While remaining stationary, you receive 3-hour reports. Of course, you’re not restricted to those two settings. The Linxup kit provides customizable trigger alerts for different thresholds and events. Want to find out if your equipment leaves a particular area? You can make it happen with a little configuration. However, you can’t get down to 20-second interval reporting, even with higher levels of the GPS service. At the heart of this panel resides a 10,600mAh lithium-ion battery. Operating a GPS isn’t exceptionally battery intensive, especially with the 10-minute to 3-hour reporting periods involved with this device. Which helps the considerable battery size do some important things for reliability. Yes, solar panels are dependent on the weather. But even in conditions where sun is thin, you’re generally able to draw enough power to keep the LAADS1 online. Because it’s not burning through power, even if you don’t have sun for an entire day, that doesn’t necessarily mean the tracker will call it quits. The high efficiency solar panel helps deliver fairly speedy battery charges. What really helps is that the solar panel is sizeable relative to the power demand of a GPS tracker. And that size is what helps the LAADS1 Solar GPS Tracker help to perform pretty well, even in subpar environmental conditions. And that’s critical because even when the sun is shining, you can expect this panel to endure subpar lighting conditions. To get the best charge, you need the solar panel to be directly facing the sun. With less direct exposure, panel performance drops considerably. That means unless a panel has a motor intended to help it track the sun, the panel’s performance will vary considerably over the course of a day. It’s size that offsets these power concerns. One more thing to keep in mind is that for maximum efficacy, solar panels need to be wiped down occasionally. How often really depends on conditions of its environment. Even without cleaning, you can generally expect years of consecutive performance. But cleaning is key to efficiency, especially if you’re someone who’s implementing the LAADS1 in an environment with challenging light conditions. The GPS control & reporting app has a fairly primitive aesthetic, but it provides all the information you need for data-driven tracking on your assets. It lets you keep an eye on motion, and presents data using charts and graphics, colored-in by detailed time and distance metrics. Plus, if you’re tracking more than one asset, you can manage them all within the same app. If you live in a place where there’s two hours of sun every day, then something like the Linxup LAADS1 isn’t going to be useful very often. The solar panel is designed to work with weaker light conditions, and keep chugging on like a champion. But in extremes, like places on the Earth with minimal sunlight, and places with temperatures that are well-below freezing, the Linxup LAADS1 isn’t going to survive. Given proper conditions, you can expect this self-charging design to last for up to ten years. After that, you’ll have to start thinking about replacement. The solar panel itself can likely survive closer to two decades, but the lithium-ion battery will have been exhausted or severely compromised by the 10-year mark. Who Should Choose the Linxup LAADS1 Solar GPS Tracker? When you choose the LAADS1, much of what you’re paying for is the weatherproofing and the solar panel. They both hold up within pretty tough environments. The only real exception is the coldest parts of the world, during the coldest parts of the year. Relative to the lengthy service life, it’s quite affordable. The real expense comes in with the GPS service, but there aren’t a bunch of hidden fees, so you can turn it on and off as you need. And that means the LAADS1 has plenty of potential. It could be great for cargo units, the chassis of a trailer, unused heavy equipment, non-powered gear, large tanks, Conex containers, and so forth. It can even serve in stealthy fashion when needed. 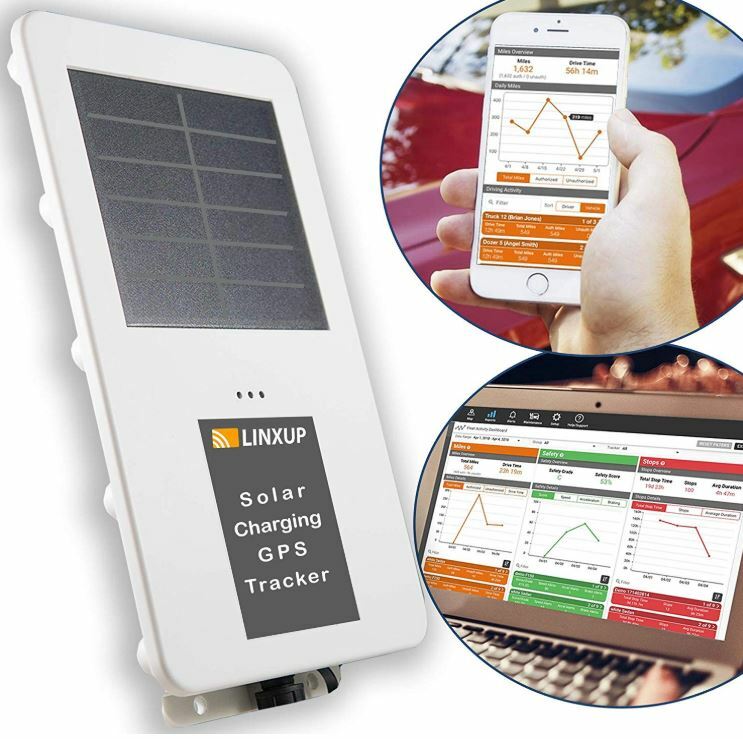 Provided you don’t live within the Arctic, the Linxup LAADS1 Solar GPS Tracking Real Time Tracker might be the most cost-effective long term GPS tracking solution on the market right now.